Adding insulation to the attic is generally a moderately difficult do-it-yourself (DIY) project, but the benefits can be substantial. If you are doing a major home renovation project, now may be a great time to tackle this project too. The good news is that, even if you're not comfortable taking on this project yourself, there are many qualified contractors who can help you get the work done. 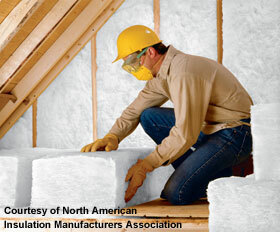 Note that EPA recommends air sealing the attic before adding attic insulation. If your attic is accessible and not too difficult to move around in, and you enjoy tackling bigger home improvement projects, attic insulating may be a good DIY project. Otherwise, consider finding a contractor to complete the project for you. 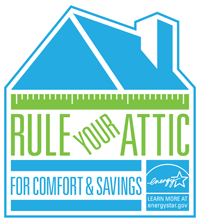 EPA recommends that you complete an attic sealing project before doing this project. Step 1. Choose the right insulation. When adding additional insulation, you do not have to use the same type of insulation that currently exists in your attic. You can add loose fill on top of fiberglass batts or blankets, and vice versa. If you use fiberglass over loose fill, make sure the fiberglass batt has no paper or foil backing; it needs to be "unfaced." If you choose to add loose fill, it may be wise to hire a professional, as the application requires the use of a blowing machine, although some home improvement stores offer rentals of this machine. Laying fiberglass rolls is easiest for a DIY job. If you have any type of insulation between the rafters, install the second layer over and perpendicular to the first (again, the second layer of roll insulation should be unfaced, with no vapor retarder). This will help cover the tops of the joists and reduce heat loss or gain through the frame. Also, when laying down additional insulation, work from the perimeter toward the attic opening. Never lay insulation over recessed light fixtures or soffit vents. Keep all insulation at least 3 inches away from recessed "can" lights, unless they are rated IC (Insulated Ceiling). If you are using loose fill insulation, use sheet metal or wire mesh to create barriers around the openings for such lights. If using fiberglass, wire mesh can be used to create a barrier. Step 2. Lay fiberglass rolls. Layer rolls of fiberglass insulation perpendicular to the joists. Step 3. Create barriers. Use sheet metal or wire mesh to help create a barrier around fixtures or vents. Insulation contacting recessed can lights can cause fire hazards. Some recessed lights can be designed for "insulation contact" or IC, in which case no barrier is needed. Check the fixture first for the IC designation before installing insulation.